Tackling congestion using the £5m pledged by Cabinet in addition to £6.6 million won as part of a bid to Department for Transport. The scheme, which is set to improve traffic flow in the area and provide a safer crossing for those who use this busy road, is due to start next week. 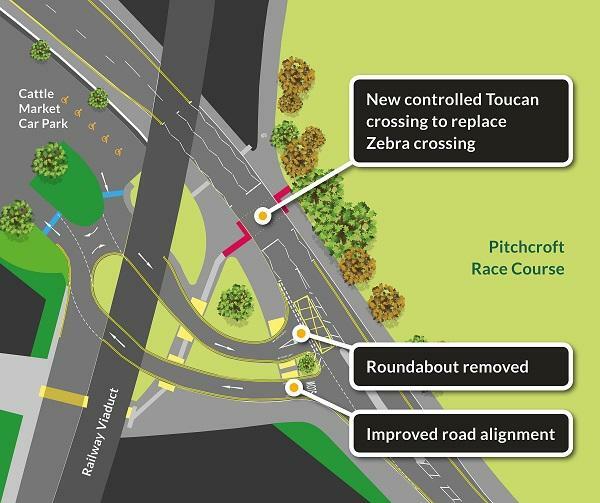 The improvements, which are being completed by Worcestershire County Council, include the upgrade of the existing uncontrolled (Zebra) crossing to a controlled pedestrian and cycle (Toucan) crossing, removal of the existing roundabout near the entrance to the Cattle Market Car Park and an improved road alignment with updated car park access. To improve the road alignment ahead of the new crossing being introduced, the current mini roundabout needs to be removed and this is the first work to be completed as part of the scheme. Whilst this takes place, temporary traffic signals will be required. Once the work to remove the roundabout is complete, the temporary traffic signals will be removed as the majority of the remaining works can be completed off the carriageway without any major impact on traffic. At the end of the scheme, the road will be closed overnight for a few nights from 9pm to 6am for resurfacing works. A diversion route will be signposted for vehicles. For the duration of the scheme, the access to the Cattle Market Car Park from Croft Road will be closed so vehicles wishing to use the car park are advised to use The Butts entrance. Pedestrians will be unaffected during the works, due to the installation of a temporary crossing and minor pedestrian diversions which will be in place at all times. Work on the first of several major crossing improvements in Bromsgrove will begin this month. Worcestershire County Council is making the improvements, thanks to the £3.4m National Productivity Investment Fund funding awarded to them by the Department for Transport (DfT) last year. with onsite works due to start on the week commencing Monday, 18 March. As previously communicated, the overall aim of the Sidbury junction improvement scheme, which will see the introduction of new signalling equipment to update the current 40 year old installation, will be to improve the efficiency of the signals. The upgrade will allow the sites to 'communicate' to each other when traffic flows vary and green light timings need to alter. The wider scheme will also consider enhancements to street lighting, footways and crossing facilities. To introduce a signalised crossing at the bottom of Commandery Road, the central reservation will need to be widened. This in turn means that we will then need to move the carriageway and then the footway over into the slabbed area where the trees were. In preparation for the works, three trees had to be removed from the bottom of Commandery Road ahead of the bird nesting season at the start of March to ensure that no nesting birds are affected by the removal of the trees. We will be planting replacement trees once the scheme is complete. Main works are due to start later this year and we will be sharing more details of scheme closer to the time. We always do what we can to prevent the removal of healthy street trees. When we absolutely have to, we always have a replanting strategy in place. Unfortunately, without the removal of these 3 trees, we would be unable to fully make the much needed improvements to this area with the aim of improving crossing facilities and relieving congestion. Work will begin on three key congestion hotspots in Worcester over the next 12 months. Croft Road by The Hive, Sidbury and St John's will undergo improvements with the aim of relieving congestion. The works are mainly funded through a successful bid of £3.2 million to Worcestershire County Council from the Department for Transport (DfT). The funding, which has come via the National Productivity Investment Fund (NPIF), is ring-fenced for investment in areas that are key to boosting productivity including for local roads. The funding is focussed to tackle known congestion 'pinch points' and inefficient junctions along the main A44 west-east axis through the City Centre. This includes the sections between St Johns and Sidbury, as well as Croft Road to the north and all the key approaches to these areas. At Croft Road, the current zebra crossing enables more than 2,000 pedestrians and nearly 200 cyclists to cross that part of the A449 on an average day without signalised control. This leads to frequent and long interruptions to the traffic flow in both directions along this route as well as affecting the signals to the south at Dolday. Plans for Croft Road, which include the introduction of a signal controlled Toucan crossing in addition to amending access to the Cattlemarket carpark, are currently being finalised. The County Council anticipate these improvements will commence before the summer with more details being released in the next couple of months. 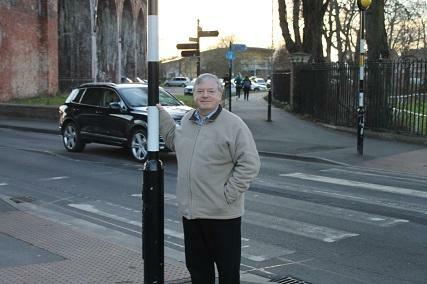 Another focus for the Council is improvement to the Sidbury and City Walls Road signalised junctions. The overall aim, which will see the introduction of new signalling equipment to update the current 40 year old installation, will be to improve the efficiency and intelligence between the two sites. The upgrade will allow the sites to 'communicate' to each other when traffic flows vary and green light timings need to alter. This scheme will also consider enhancements to street lighting, footways and crossings facilities. Works are anticipated to start later this year and more details will be confirmed closer to the start date. The third hotspot for improvement is St John's. The Council is planning to improve road widths, pavements and crossing facilities to make it easier for all those using the area to move around. Initial designs for the scheme have begun with more details planned for release in the autumn. Worcestershire County Council's Cabinet Member with Responsibility for Highways, Cllr Alan Amos said: "It's great news that we will soon be in a position to share more details on these key schemes after a period of closely evaluating the issue and potentials solution available. "Cutting congestion remains a priority for the council and with the additional funding proposed for the next 3 years, even more can be done to tackle the hotspots around the county". The Council is also proposing a further £5 million, over 3 years, in this year's budget to tackle four hotspots in Kidderminster, Evesham, Bromsgrove and the staggered junction just outside of Upton upon Severn. The budget is due to be considered at the next full council meeting on 14 February. Some of the funding to relieve congestion announced in a previous budget, has already been used to improve signals at key junctions across the city such as Shrub Hill/Midland Road. Seabright Avenue/London Road and the signals outside of Waitrose on London Road. These improvements include adding new technology which ensures that more time is given to the priority flow of traffic and therefore reducing congestion. Next on the list is to roll out junction improvements at North Quay crossing, Dolday and The Butts. In addition, another £3.6m NPIF funded scheme, which focuses on improving walking and cycling routed in Bromsgrove, is well underway. Sites outside of the City also include improvements at Queen Street -Droitwich, Worcester Road Kidderminster, Icknield Street Drive, Redditch and Evesham Road, Astwood Bank. Works are almost completed on the A442 Worcester Road, Kidderminster, where the hatched section of dual carriageway was causing severe tailbacks. The restriction was removed back in May, repairing the surface, enhancing the signing and lining on the approaches, as well as introducing improvements at the A4442 Silverwood Way signals. Further markings to the carriageway are on order and will further enhance this well-received improvement. At the Tallow Hill/Shrub Hill traffic lights in Worcester, the signals and their phasing have been upgraded and improved flows should now be seen for those using the junction, including the bus route between the hospital and City. We have some fine tuning to carry out with the phases of these signals which are imminent. In Redditch, where Icknield Street Drive meets the Warwick Highway, queuing traffic was raised as a concern so a widened section of carriageway has been introduced on the southern approach to the island during the late summer. This has seen the lane capacity double for both manoeuvres, allowing left/straight on and right turning traffic function far more efficiently. Improvement works on the phasing of signals have already taken place behind the scenes along the A44, including Waitrose, Seabright, the crossings at the river bridge & North Parade and New Road/Tybridge St island. Works are still ongoing at other signals located at Copenhagen St, Deansway crossing, Dolday/The Butts with these being scheduled for completion in early 2019. Plans are also nearing completion for the improvements to the crossing on Croft Road as well the major overhaul of the City Walls Rd/Sidbury junction. More details on these plans will be shared early next year with work starting summer 2019.